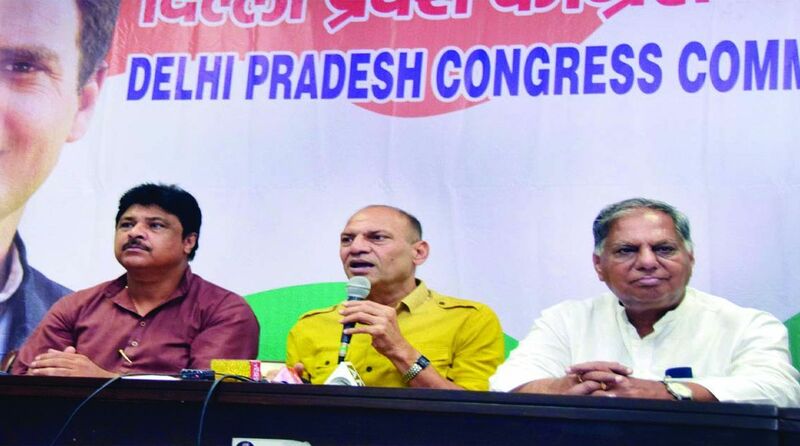 Delhi Pradesh Congress Committee has decided to intensify its “Nyay Yudh” agitation in protest against the “illegal” sealing of non-polluting household industries after receiving “overwhelming support” from the people as it has “ruined” many lives and rendered lakhs of persons jobless. Senior leader and ex-MLA Mukesh Sharma, who is the coordinator of the “Nyay Yudh”, announced here on Friday that in the second phase of the agitation, the Delhi Congress would hold a massive “Halla Bol” rally against the BJP and the Aam Aadmi Party on 9 September at 4 pm at Tri Nagar in the Chandni Chowk parliamentary constituency. Former MLA from Tri Nagar Anil Bhardwaj will preside over the “Halla Bol” rally at Tri Nagar. For the past five days, Bhardwaj has been making preparations for the “Halla Bol” rally. People of Tri Nagar are not only angry with the sealing of non-polluting household industries, but are also ready to go to any extent in protest against the drive. In a statement, Mukesh Sharma said the sealing has robbed the people of their livelihood. Quoting local sources, Sharma alleged that a labourer from Bihar, Ram Mehto, committed suicide in Tri Nagar “because of being fed up with the sealing”. Expressing his sorrow at the tragedy, Sharma said that despite people taking such extreme steps in the Capital, the stony silence of the BJP and the Aam Aadmi Party shows that they are hand-in-glove in the sealing drive. He said that the Congress party does not approve of extreme steps like suicide and appealed to those affected by the sealing to keep peace and do not take any drastic steps. Sharma said that the Delhi Government and the Municipal Corporation of Delhi have not only been “violating” the rule of law at Tri Naga and surrounding areas, but such properties are also being sealed as are in the areas declared as industrial areas. He said that in its “Halla Bol” rally, the Congress will demand regularization of areas with 70 per cent industrial units as industrial areas. The party will also hold a “Halla Bol” rally against the “loot being made” by the BJP-ruled MCDs in the name of conversion charges.